This was a huge week in Team Fortress 2 history! We’ve got things from every year back to 2008! 2008 saw Valve finally fix a glitch that was funny maybe the first time you witnessed it; Engineers could upgrade the dispensers in payload carts so they healed more than they should. This kind of broke payload, and was a welcome removal. On December 11th they also added some features that are now huge parts of the metagame: Teleporters and dispensers were given a Level 3 (previously only Sentries had a Level 3), spies could now recharge cloak by picking up ammunition, sticky bombs became destroyable by hitscan, and a lot of new particles were added. Basically every note in the patch is memorable, read it here! 2010 saw the rewards for the Great Steam Treasure Hunt revealed: Various treasure-themed hats, with the ultimate reward being the Hat of Undeniable Wealth And Respect, a hat that required buying over $200 worth of Steam games and completing in order to qualify for. And people say unusuals are expensive. Six new paints debuted, (“Pink as Hell”, “A Color Similar to Slate”, “Drably Olive”, “The Bitter Taste of Defeat and Lime”, “The Color of a Gentlemann’s Business Pants” and “Dark Salmon Injustice”) and the first 5 sets of Mann Co. Crates were retired, replaced by Series 6-9 (which included the first ever holiday crate). December 13th saw the release of the Stockbroker’s Scarf and Foster’s Facade, one of Valve’s first cross-game promos and the only ones to come in Vintage form. It’s directly responsible for the creation of the Genuine quality, as even today there are more Vintage scarves and facades than Unique ones. Please Santa, can I have my own Grordbort set? 2011 saw the release of the first Naughty and Nice Winter Crates, which have now become a mainstay. 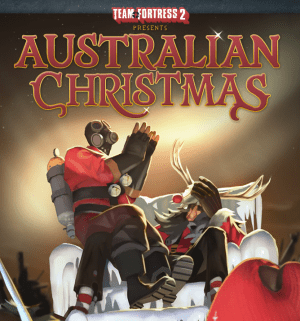 I personally uncrated a Strange Festive Scattergun, which I almost immediately traded for a Holiday Punch and a Spycicle……two days later, on the 15th, came the Coveted Australium Christmas Update. new weapons, cp_foundry, double drop week…a lot of great TF2 stuff came into existence today. Engineer and Pyro Grordborts became a thing, Jingle Belt and Bootie Time became the first cosmetics with a redtext downside, and the Spirit of Giving became the first strange cosmetic. Foundry was the first map to include the achievement “Win this map a ridiculous amount of times”, which has since been added to every new map and convinced me to stop trying for achievements. Exactly one year after the first Naughty/Nice crates, December 13 2012 saw the next set, this time containing Festive achievement weapons (and the Holy Mackerel for some reason). If you want my guess, the new Festives will be items from Polycount/2010 Christmas sets, since each class has one except Engineer. He’ll probably get a Festive Pomson because Valve can’t resist giving everything cool to the Pomson for no reason whatsoever. Also, the Faerie Solitaire Pin became a thing, delighting a number of SPUFers especially Huff. Pretty huge week, and due to its proximity to Christmas it can expect to continue being huge in years to come. Next Next post: Medieval Highlander results!